What if going green was free? Net Zero Contractors and our sustainable partners have teamed up to bring you a line of beautiful, affordable and sustainable homes. Featuring cutting-edge design and energy- efficient construction, Our homes are versatile in design that pairs aesthetic simplicity with sophisticated technology. 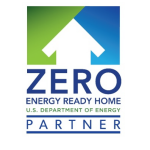 The U.S. Department of Energy defines a net-zero energy home as one that uses about 60 to 70 percent less energy than a conventional home, with the balance of its energy needs supplied by renewable technologies. Essentially, it is a home that sustains itself – energywise. That doesn’t mean that it is “off the grid.” Actually, it may use some energy from the local utility. But a net-zero energy home generates the bulk of its own energy and makes enough extra energy to sell it back to the utility through “net metering,” offsetting the amount purchased. Because of the energy-efficient products used in a net-zero energy home and because it requires so little energy from the utility companies, net-zero energy homes also have the potential to reduce greenhouse gas emissions and reduce dependence on foreign oil. Many net-zero energy homes also use building materials made from renewable resources – for even greater sustainability. Net Zero Contractors building the future today. To learn more about building a custom net-zero home or making your existing home more energy efficient, contact us.